KVH Industries, Inc. announced today that global ship manager Nordic Hamburg has chosen KVH's new advanced TracPhone V7-HTS antenna equipment and the AgilePlans subscription-based Connectivity as a Service (CaaS) program to bring fast, global connectivity to its vessels. Installations for 13 vessels have been completed, with plans for an additional 12 through 2018. "The AgilePlans program provides the highest flexibility for our fleet and we were also attracted to KVH's global coverage, CommBox network management solutions, fast data speed, and the great crew welfare services that are included," says Jacobus Varossieau, operations & insurance manager for Nordic Hamburg. "We are very pleased to have found a solution that enables us to offer our customers exceptional value and connectivity. This applies to both our operational efficiency as well as offering our valued crew fast, effective, and reliable communications. In addition, KVH has provided excellent ongoing support and we now have a service that helps us future-proof our shipboard communications in line with today's digital demands." The AgilePlans program provides equipment and airtime for one simple monthly fee, with no commitment; installation at select ports and global tech support are also included, as well as NEWSlink TV and NEWSlink Print news, sports, and entertainment content delivered via KVH's IP-MobileCast content delivery service. 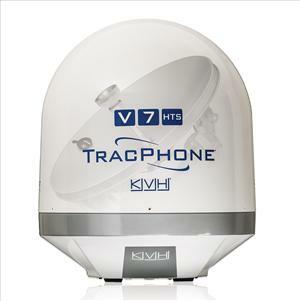 The TracPhone V7-HTS is a 60-cm Ku-band satellite communications antenna that utilizes high throughput satellite (HTS) technology, with connectivity from KVH's mini-VSAT Broadbandsm network. By providing download speeds up to 10 Mbps and upload speeds up to 3 Mbps, the TracPhone V7-HTS helps vessels benefit from marine applications for improving operational efficiency. Each TracPhone V7-HTS includes a belowdecks Integrated CommBox Modem (ICM) with built-in capability for onboard network management solutions. "We take great pride in building strong bridges with our customers, offering reliability, accountability, and support," says Rob Parkin, maritime sales director for KVH. "This is a recipe to providing a very powerful service experience that fulfills our customers' communications and business expectations." "The innovative commercial model offered by AgilePlans along with the unique unlimited-use and high-speed dual channels of the TracPhone V7-HTS give our customers a competitive edge in today's demanding maritime industry," says Thomas Plüschau, KVH's regional sales manager for Germany. "We help customize a solution to each customer's requirements in terms of data volume, speed, complexity, and budget."